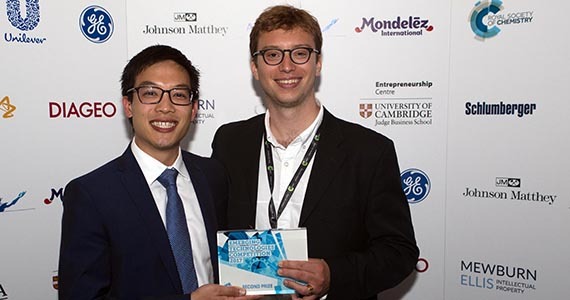 Echion Technologies Managing Director, Jean de La Verpilliere, (right) with Cambridge Enterprise Technology Associate, Ben Ting, at the Royal Society of Chemistry awards. A team of University of Cambridge engineers who are hoping to fuel an electric bus revolution are a step closer to their goal after their next-generation nanotechnology battery was commended in the 2017 Emerging Technologies Competition. The University of Cambridge spin-out, Echion Technologies, was awarded second-place and £10,000 to help commercialise its invention in the Energy and Environment category of the annual Royal Society of Chemistry competition. Echion Technologies was founded by Department of Engineering researchers Dr Michaël De Volder (Institute for Manufacturing), Dr Adam Boies (Division of Energy, Fluids and Turbomachinery) and Jean de La Verpilliere (NanoDTC Translational Fellow). Echion Technologies also received a second award this week - it was named runner-up in the King's College Entrepreneurship Prize after Mr de La Verpilliere, who is Echion Technologies' Managing Director, impressed the King's Lyons Den with his presentation. Developed over the past two years, their new technology is a novel hybrid nanomaterial that could herald the third-generation of high-performance automotive batteries. The nanomaterial replaces graphite as the standard material used in the negative battery electrode (graphite anode) of lithium-ion batteries – the type of batteries used in electric vehicles. This advanced nanomaterial significantly improves energy density, capacity, battery-life, safety and cost compared with current commercially available batteries. Leader of IfM’s NanoManufacturing research group, Dr Michaël De Volder, says their nano-based anode technology triples the storage capacity of conventional graphite anode technology used in lithium-ion batteries: “Most automotive batteries still rely on graphite-based negative electrodes, which is a 25 year-old technology. Our technology delivers significant improvements both over the current commercial graphite batteries and the upcoming second-generation lithium-ion battery technology that uses nanosilicon. A key feature of our material compared to nanosilicon is its ability to withstand very high intensity charge or discharge rates (power) without deteriorating. For buses and coaches the primary requirement is power density – how fast you can charge the battery and accelerate the vehicle. Cambridge Enterprise is working with Echion Technologies to commercialise its high-performance lithium-ion batteries for use in electric buses. Echion Technologies’ Managing Director, Jean de La Verpilliere, says there is a rapidly growing market for their technology: “Society is increasingly relying on carbon-free technologies for transportation, especially for public transport in large cities. Experts envision that it may become socially unacceptable to use internal combustion engines in large European cities by the early 2030s and the city of London recently stated that it will not purchase diesel buses beyond 2018. “However, lithium-ion batteries have recorded a slow incremental improvement over the past 25 years and there is a strong need to significantly improve the performance of Li-ion batteries to make them a viable energy option for mass market transport such as public buses. Echion Technologies’ invention is based on innovation around the fundamental chemistry and nanostructure of a lithium ion battery’s active anode material. The name ‘Echion’ was inspired by the ancient Greek word for ‘spiny’ (ekhinos), which loosely describes the nano structure of the novel battery material. Cambridge Enterprise Seed Funds made a PathFinder loan to Echion Technologies in 2017. The company was also accepted into the 2017 Technology Development Accelerator Programme of the Advanced Propulsion Centre. Echion Technologies has gained significant traction in securing investments to build its value proposition in preparation for their seed-funding round, which they hope to close in early 2018.